In March 2010, Governor Arnold Schwarzenegger signed two fuel tax measures (AB x8 6 and SB 70), commonly referred to as the fuel tax swap, which adjusted the rates of the sales and excise tax on gasoline, effective July 1, 2010. The fuel tax swap legislation was designed to be revenue neutral, ensuring overall state taxes paid by consumers at the pump are the same as they would have paid under the prior tax structure. Thus, the fuel tax swap legislation does not produce a net revenue gain in overall state taxes paid at the pump. The legislation mandated the BOE to adjust the excise tax rate every year by March 1. The new rate is effective July 1 of each year. The Board will consider raising the excise tax rate for gasoline by $0.019 for Fiscal Year 2017-18 at its February 22-24 meeting in Culver City. The current excise tax rate of $0.278 per gallon for gasoline remains effective through June 30, 2017. The new excise tax rate of $0.297 will be effective from July 1, 2017, through June 30, 2018. State law currently imposes a sales tax and an excise tax on motor vehicle fuel. The legislation mandates the BOE adjust the excise tax rate annually by March 1. The 2.25 percent sales tax on gasoline primarily funds local government; the excise tax is dedicated to public roads and mass transit. For more fuel statistics, including taxable gallon distributions and revenue, visit the OPEN BOE data portal. The graph below shows the amount of money collected in excise tax revenue and the excise tax rate from the fiscal year before the fuel tax swap took effect and every year since. 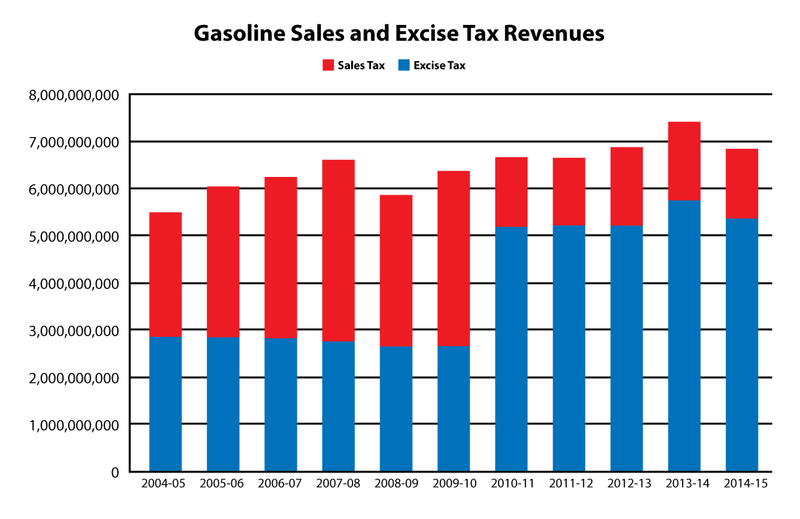 The graphic shows combined excise and sales tax revenue from Fiscal Year 2004-05 to 2014-15.